A note for non European visitors. Bjorn Ulvaeus is a member of a very famous pop group named ABBA. They were massive in the 1970s (after winning the Eurovision Song Contest). They have since disbanded. Subject: PLEASE,YOUR URGENT CALL/RESPONSE IS HIGHLY NEEDED ! PERMIT ME TO INFORM YOU OF MY DESIRE OF GOING INTO BUSINESS RELATIONSHIP WITH YOU. I GOT YOUR NAME AND CONTACT FROM THE IVOIRIAN CHAMBER OF COMMERCE AND INDUSTRY. I PRAYED OVER IT AND SELECTED YOUR NAME AMONG OTHER NAMES DUE TO IT'S ESTEEMING NATURE AND THE RECOMMENDATIONS GIVEN TO ME AS A REPUTABLE AND TRUST WORTHY PERSON I CAN DO BUSINESS WITH AND BY THEIR RECOMMENDATIONS I MUST NOT HESITATE TO CONFIDE IN YOU FOR THIS SIMPLE AND SINCERE BUSINESS. I AM FREDRICK MOMOH, THE ONLY CHILD OF LATE MR AND MRS JOHN MOMOH, MY FATHER WAS A VERY WEALTHY COCOA MERCHANT BASED IN ABIDJAN, THE ECONOMIC CAPITAL OF IVORY COAST BEFORE HE WAS POISONED TO DEATH BY HIS BUSINESS ASSOCIATES ON ONE OF THEIR OUTING TO DISCUSS ON A BUSINESS DEAL. WHEN MY MOTHER DIED ON THE 21ST OCTOBER 1984, MY FATHER TOOK ME SO SPECIAL BECAUSE IAM MOTHERLESS. MY NAME AS HIS ONLY SON FOR THE NEXT OF KIN IN DEPOSIT OF THE FUND. MONEY AND USE IT FOR INVESTMENT PURPOSE ,(SUCH AS REAL ESTATE MANAGEMENT). SIR, IAM HONOURABLY SEEKING YOUR ASSISTANCE IN THE FOLLOWING WAYS. 2) TO SERVE AS THE GUARDIAN OF THIS FUND. RESIDENTIAL PERMIT FOR ME IN YOUR COUNTRY. THE SUCCESSFUL TRANSFER OF THIS FUND TO YOUR NOMINATED ACCOUNT OVERSEA. BE CONCLUDED WITHIN SEVEN (7) DAYS YOU SIGNIFY INTEREST TO ASSIST ME. ANTICIPATING HEARING FROM YOU SOON. I do not know how you found my private address, but I am interested in your proposal. Please tell me more. How are you and your work?I believe that all is well with you.I thank you very much for your mail which I just read this Monday morning. But first of all,I want you to send me a promising note indicating that you will not cheat me or seat on this money when it gets into your account,because this my inheritance is my last hope on this Earth. I will also like you to hasten up so that this money could be quickly transfered into your account for an investment. Secondly,I also want you to keep this matter secret between two of us as you've read from my first mail of how my late father was killed by the evil jealous men.Of which,I am into hiding where I am now, so that they will not kill me also as they did to my father. Finally,as soon as I heard from you,I will give you the name and the contact of the bank where this money was lodged by my late father for you to contact them for the transfer. For as soon as I finished writing to you,I will go straight to the bank to inform them about you as my foreign partner whom this my inheritance will be transfered into his account for proper investment that will yeild us more profit. Please,I will like you to call me with this phone number(+225 0773 3806) which I've ealier given to you as soon as you receive this mail,so that I will detail you with more informations since I could not get through with your phone here due to poor communication. I am expecting your urgent phone call/response immediately you receive this mail because I want everything to be fasten up so that this money will be quickly transfered into any account that you will provide and I will at the same time come over to you in your country for the continuity of my education. Please note, I am a member of a famous European singing group and because of this I travel quite extensively, so telephoning you may be a problem until I get to the tour hotel room. In the meantime, please feel free to contact me on my private number of +001 206 350 4055. If I am not there to speak with you, please leave a message and I will try to get back to you as soon as I have got rid of the groupies. Please note that because of my intensive travelling schedule, I am very busy so you may need to keep trying. That telephone number should automatically forward your call to my current location. To get back to your letter, you can be assured of my honesty sir. I would not do anything which would compromise my position or or have any negative effects for my singing group (photograph attached - I am the one on the left) so you can rely on my 100% honesty and confidentiality. Subject: PLEASE,DO CONTACT THE BANK AND GET BACK TO ME TODAY !! How are you and your work?I strongly believe that all is well with over there.I thank you very much for your mail and also for your handsome picture that you sent to me. I am well pleased to hear your proffession as a famous musician.I also thank you for the assurance honest that you promised to me. The name of the manager is, MR.Jean Kwassi. Please do contact the bank immediately you receive this mail and kindly get back to me.Because I want this transfer to be quickly done so that I will come over to your country for the continuity of my education. I am also sending you my own picture just like you did in order for you to see and know whom you are dealing with. I am highly expecting to hear from you today after contacting the bank. Many thanks for your email, and the contents are fully understood. Thank you for your picture also. If you need to contact me to discuss this situation, please call me on +001 206 350 4055. As I am quite busy you may have to leave a message with my answering service. If you do this, please before leaving a message speak the password "abba rules". This is so I know the call is genuinely from you. Thanks once again for your urgent response. As for the phone number of the bank that you've been trying to get through,this is how you are going to dial the number and you will get it direct without having any problem. First dial your international dialing code number,and after that you just dial the bank phone number as it is written (225 0532 8713) dial all of them and you will get through immediately. I am waiting for your urgent response after the contact. I am well aware how to dial international locations, I travel the world on a regular basis doing concerts. I have tried the number again exactly as you described, but it simply does not work. Do you have telephones in your country? Please if really you want to assist me to get this money into your account kindly try and get the bank director by phone or you can write them through their e-mail address which I was included to the phone and fax number I gave to you. Please I want to let you know that without reaching the bank, there is nothing I can do as you are the person to contact them first and instruct them how you want to transfer the money to the account you will provide for them. Thanks and God bless you for your efforts. Please tell me what you would like me to write to the bank, I haven't a clue? Subject: DO CONTACT THE BANK BY EMAIL OR BY PHONE TODAY AND GET BACK TO ME ! How are you over there?I believe very fine.Thanks for your mail which I just read this morning. When contacting the bank,just tell the bank manager that you are writing or calling on behalf of I, mr.Fredrick Momoh.Tell them that you are calling or writing as my foreign partner whom I want my inheritance to be transfered into any account that you will provide for them. Please,do contact them as soon as you receive this mail and quickly get back to me,because I want this transfer to be done very fast so that I will come over to you for the investment of the money in your country. I am writing to you on behalf of Mr. Frederick Momoh. I present myself as his foreign partner and I would like to facilitate the transfer of his inheritance into my account, the details of which will be provided shortly, if I can be at all bothered to do it. I await your reply on this matter. Please remember to quote Mr. Momoh's name on any future correspondence as I am hard of hearing. WE DO ACKNOWLEDGED THE RECEIPT OF YOUR MAIL,AND ALL THE CONTENTS ARE WELL UNDERSTOOD.LATE MR. JOHN MOMOH WAS ONE OF OUR NUMEROUS CUSTOMERS. (MAY HIS GENTLE SOUL REST IN PERFECT PEACE AMEN).FROM OUR DATA,WE FOUND OUT THAT OUR LATE CUSTOMER,MADE MR.FREDRICK MOMOH HIS NEXT OF KIN TO THIS FUNDS BEING HIS SON.AND ALL THAT HE(MR.FREDRICK MOMOH)YOUR LOCAL PARTNER SAID TO YOU ABOUT HIS LATE FATHER'S USD$16.5M WHICH WAS DEPOSITED IN SUSPENCE A/C IN OUR BANK IS CORRECT. BUT THERE ARE SOME CERTAIN DOCUMENTS THAT THE BANK NEEDED FROM YOU AND HIM BEFORE WE CAN MAKE THE TRANSFER INTO YOUR ACCOUNT. TO THIS EFFECT THE BANK IS REQUESTING FOR SOME LEGAL DOCUMENTS FROM THE FEDERAL HIGH COURT HERE IN COTE D'IVOIRE SIGNED BY THE CHIEF JUSTICE OF THE FEDERATION. 4)DEATH CERTIFICATE OF HIS LATE FATHER. THIS AFFIDAVIT FOR CHANGE OF OWNERSHIP WILL BE SWORN IN THE FEDRAL HIGH COURT HERE IN COTE D'IVOIRE ON YOUR BEHALF FOR THE CHANGING OF THE OWNERSHIP OF THE FUNDS IN YOUR NAME AS THE NEW BENEFICIARY,WHICH WILL ENABLE THE BANK TO TRANSFER THE MONEY TO YOU EASILY. PLEASE NOTE:THAT SINCE MR.FREDRICK MOMOH,IS NOT THE ORIGINAL SIGNATORY TO THE DEPOSITED FUNDS BUT RATHER HIS LATE FATHER WHO HAPPENED TO BE OUR LATE CUSTOMER,THIS BANK IS REQUESTING YOU AND YOUR LOCAL PARTNER(MR.FREDRICK MOMOH) TO PROVIDE THE ABOVE LISTED LEGAL DOCUMENTS FROM THE FEDERAL HIGH COURT FOR US TO BE ABLE TO ADHERE TO THE INSTRUCTION THAT WILL BE GIVEN TO US TO CONTACT YOU FOR AN ONWARD TRANSFER OF THE FUNDS INTO YOUR ACCOUNT DESIGNATED.FOR AS SOON AS THOSE DOCUMENTS ARE SUBMITTED,WE CAN NOW MAKE THIS TRANSFER INTO YOUR ACCOUNT THAT YOU WILL PROVIDE. DO HELP US TO SERVE YOU BETTER. Subject: HAVE YOU CONTACTED THE BANK? PLEASE,I WANT TO HEAR FROM YOU TODAY ! How are you and your work?I believe that you are alright over there.I have not heard from you again why? Have you contacted the bank? please,I want to hear from you as soon as you receive this mail for it is very important. Yes, I contacted the bank (their reply is below), but I am not happy. You pass me onto the bank, now the bank wants to pass me onto somebody else. Please Fredrick, this is not the way I usually do business, and a better way will have to be found if you require my help. Subject: I WILL BE GOING TO THE BANK IMMEDIATELY I FINISHED WRITING TO YOU ! How are you over there?I believe that all is well with you. I thank you for your mail. I don't understand what you meant by that you were not happy.I told you to contact the bank in order for them to know whom my foreign partner is and also for them to inform you on how the transfer is going to be done. Subject: VERY URGENT PLEASE !! How are you and your work?I believe that things are moving very fine with you over there.As I ealier told you in my last mail that I will be going to the bank to know whom and where those documents will be obtained. I quickly went to the bank to meet with the bank manager for him to explain better on how I could obtain the required legal documents from the Federal High Court Abidjan Cote D'Ivoire.The manager (Mr. Kwassi )directed and recommeded to me on whom to meet at the Federal High Court to assist me. Please,I will need your assistance in this regard as I already have my father's "Death Certificate" but remaining the other documents. Please I have no other person to go to as far as the obtaining of these documents are concerned. From what the bank manager said ,immediately I present these legal documents to the legal Department of the bank, an authorisation letter will be given to me which will instruct the bank to contact you immediately and transfer the money into the account you will forward to them .Please,bear also in mind that any money that you spent into this transfer,will be deducted first from the total money as soon as the money enters into your account. Please,I am highly expecting your urgent/positive response as soon as you receive this mail. I am disturbed that the Federal High Court are demanding $2,225 for Stamp Duties and other Legal Fees, but considering the amount of money that will be freed by this small expense the payment should not be a problem for me. However, may I suggest that I arrange to fly to Abidjan and pay you the $2,225 in cash in person? I have a friend in the Foreign Office who I can bribe quickly get a VISA for me. Let me know ASAP and I will speak to my friend Phil Mypockets. Please signal your agreement to this suggestion and I will withdraw the cash and send you my flight details once I have them. How are you and your work ?I believe that you are very fine over there.I thank you very much for your mail. I am very glad for your maximum assistance towards this my situation here. Meanwhile,regards to your coming with money in cash,I so much love to see and meet you face to face. [I bet you would] Please, I want you to hasten up because there is a heavy civil war that wants to come into this country between the rebels and the government troops. So please,I want you to come with money very quickly so that the documents will be obtained for the transfer to take place immediately and at the same time two of us will travel back to your country for the investment of the money in your country. I am expecting your urgent flight schedule in order to know the very day and date of your arrival to the airport here. Thank you for your email. One final thing before I proceed to book my flight. I have decided a 1 day stay in Abidjan should be enough for us to conclude our business. As I will be staying overnight I will require a hotel to be booked for me. I am familiar with the Accord group of hotels, and I notice that they have a hotel in Abidjan, the Sofitel hotel. As I will be paying for my flight, which will be in the region us US $2,400 plus the cost of the fee of $2,225 for Stamp Duties, I would appreciate it if you would take care of booking the Sofitel hotel room for me. Please signal your agreement to this and then I will forward you my flight details so that you know which day to book the hotel for. One final thing, I would appreciate it if you could try to find out if further fees may be required. I realise that these things never run as smooth as you like, and if there are to be further fees then I would like to know so that I can bring extra cash if needed. Subject: VERY VERY URGENT PLEASE FOR IT IS HIGHLY IMPORTANT ! How are you once again?I believe that you are alright. I am always thanking you for all your efforts that you've been putting in order to see the success of this transaction. As I was told and assured by the bank manager,that as soon as those legal documents are obtained and submited to them,that there will be no any problem again for the transfering of the money into your account. This is the only money needed just for those documents. This latest plan was decided due to the incoming war that is likely to come into the country between the rebels and the government troops as I have ealier told you. I myself love the new idea at hand now,so I want to know your own mind towards that too. Please,I am highly expecting your urgent response as soon as you receive this mail today. No problem. Tell you what Fredrick, why don't I pour petrol over my testicles and set fire to them as well? 1. That I fly to you and hand over the $2,225 (or more if required, see below) in person. 2. That you book me in for ONE night at the SOFITEL hotel in Abidjan. This whole procedure will be at a cost to me in the region of US $5,5000 + any further processing costs, so I am sure that you or your banking partners can do me the courtesy of booking me a hotel for ONE single night. Good God man! Once I have met with you and the Sixteen Million Dollars has been released, I will reimburse you for the hotel fee and also your time and trouble. Please note that flying to Abidjan will not be a problem as I am also coming to Africa to visit some friends in Nairobi. As soon as you are in agreement with the terms above I will book my flight and forward you my booking receipt and flight itinerary. As I mentioned in my last email I would appreciate it if you could try to find out if further fees may be required. I realise that things never run totally smooth so if you foresee that there may be further fees then I would like to know so that I can bring extra cash if needed. Please let me know the TOTAL amount your partners require. Subject: I AM EXPECTING YOUR FLIGHT SCHEDULE DETAILS URGENTLY !!! I thank you very much for reminding me of asking if there will be any other obstacle. [You're quite welcome] For even the bank manager doesn't know that the certificate has to be obtained. My attorney informed me that since after the civil war in this country and also the terrorist attack in America,that any transfer now must have that certificate attached in other to pave way for the successful transfer of the money. Concerning the hotel reservation that you are talking of, my attorney told me to inform you not to bother you. For I should let you know that on your arrival at the airport, just make a phone call and I and my attorney will come and take you straight to any hotel of your choice which will be taken care of by him. Please,I am now expecting your flight schedule details in your next mail. Thank you also for clearing up the final fee total. $6,825 seems fair to me considering the total amount that will be cleared. Tell your attorney that I am not a fool. I will NOT fly to his location until he agrees to book me in for ONE night at the SOFITEL hotel in Abidjan BEFORE I arrive. Once he signals his agreement, I will then book the flight and forward you my booking receipt and flight details so that the attorney knows what day to book the room for me. Then I will expect a receipt of booking to prove the room has bee reserved. Tell your attorney that I will absolutely NOT book my flight until he or his representatives agree to this. If he cannot agree to this then I am sorry but our partnership will be at an end and I shall carry on with my concert tour of Afghanistan. Subject: OK,ACCEPTED.GO AHEAD AND SEND YOUR FLIGHT SCHEDULE DETAILS !! Thanks for your urgent response.Ok,I've phoned my attorney and he has agreed to your condition. Could you please go ahead and send your flight schedule details. Flight details attached. I now expect to see my hotel booking receipt ASAP. Subject: THANKS FOR YOUR FLIGHT SCHEDULE DETAILS THAT YOU SENT TO ME !!!! Thanks once again for your flight schedule details which you sent to me. Please,I would like you to send me your single picture so as to know you quite well. I am expecting it urgently as soon as you receive this mail. From your flight schedule,it shows me that you are currently in London right? If I want to call you with that your phone number which you gave me,will I get you on line?Because the phone number you gave me is American line. I am highly expecting your urgent response towards my mail. Please find attached my passport picture for your records. I hope you will do me the courtesy of attaching your passport image to me as well. I am in the UK presently. As I have explained previously, the phone will automatically forward all calls to my present location. You can try my direct UK telephone number if you prefer. The full number and code is +44 7092 037387. Please note that my answer service will pick up automatically if I am not available (I am extremely busy). Please leave a message if I am not at home and I will attempt to get back to you when I can. Please note that you are required to leave a password. This prevents people I do not know from wasting my time. The password phrase for today is "I AM A BENDER". Please say it slowly for clarity. It may be a good idea to repeat it a few times as my answer service does not record very well. I am also waiting for the booking receipt from the hotel. Please forward this to me ASAP. Subject: FROM FREDRICK MOMOH !! How are you my dear one? I believe that you are in good condition over there. [YAWN] I thank you very much for your mail attached with your passport copy. I am also very happy for the password which you sent to me that will be guiding two of us. As for the receipt of the hotel reservation,I will send it to you as soon as it is booked. How are you there?I believe that you are alright. Please,this is to inform you that everything moving very fine. Meanwhile,there is this favour that I am demanding from you,I want two of us to communicate with you by phone at least to discuss with you on phone for at least for some minutes. For you know that those two phone numbers that you gave to me indicated that if I call,that it will enter into an answering machine.Now I want you to leave the two phones opened so that I can get you online or you can equally call me with my the same number that I ealier gave to you which is(+225 0773 3806) just for two of us to exchange some few words on phone in order to hear the voices of each other.I am waiting for your phone call or you give me time that I will get you on line. PLEASE will you forward me the hotel booking receipt? You seem to be making many requests of me, without showing any will to provide information for me. I am seriously annoyed. 1. Sent a photograph of myself. 2. Written to the bank on your behalf. 3. Withdrawn $6,825 to pay fees. 4. Paid over £4,700 for a flight ticket. 5. Sent you my personal passport details. I have done all this with nothing much in return from you. I am sorry but I now must demand to see the booking/reservation receipt. My flight is scheduled for Friday, which is only a few days away. Please send me the booking receipt for validation in the next 24 hours, THEN I may consider any further requests from you. Subject: YOUR HOTEL ROOM HAS BEEN BOOKED AT THE HOTEL SOFITEL ABIDJAN. How are you over there?I hope that you are alright.Yes I and my attorney have succeded in booking a room in hotel sofitel as you requested. Now here is the hotel's phone number(+225 20 22 11 22)you can call them to confirm the reservation which was made in your name. One more thing,my attorney said that he will be sending somebody to the airport to welcome you and how you will recognise the person through a borad that your name will be written on it,as soon as you see the person,you will give him a sign and at the same time follow him for he is the person that will also assist you in some of the airport's regulations here. I am highly expecting your arrival on the Friday as you ealier stated.And I also want this done urgently so that I will leave this country because there is recent war again that will be coming into the country as the rebels has backed out from the government yesterday of which if you tune up your media,you will also hear the same news. I am wishing you a safe journey down here. I am booked to leave on my flight in less than 48 hours time, and STILL you (or your contacts) are messing me about. This will now be my last email to you. I will try to make my request plain, it is VERY simple. I WANT A SCAN OF THE HOTEL BOOKING RECEIPT AND CONFIRMATION NUMBER. I WILL NOT TRAVEL WITHOUT THIS SCAN. Please contact your representatives and tell them they have 24 hours to send me the CLEAR scan or the deal is off. THE ATTORNEY OF YOUR LOCAL PARTNER IN THE NAME OF MR.FREDRICK MOMOH. HIS ATTORNEY CALLED TO MY OFFICE THIS AFTERNOON NARRATING SOME SORT OF DIFFICULTIES THAT YOU PEOPLE ARE ENCOUNTERING CONCERNING A HOTEL RESERVATION TO YOU. I AM HEREBY USING MY VERTO POWER AS THE BANK MANAGER OF THIS BANK,ASSURING RESERVING YOU OUR GUEST HOUSE WHICH IS MORE DECENT AND SECURED MORE THAN THAT OF THE HOTEL SOFITEL.OF WHICH EVEN IF YOU WANT TO BE IN THERE FOR TWO OR THREE DAYS,THERE IS NO PROBLEM, FOR YOU ARE NOT GOING TO BE CHARGED EITHER. I DO BELIEVE THAT YOU WILL RECEIVE THIS MY URGENT/SHORT NOTICE TO YOU IN GOOD CONDITION. Please tell Mr. Momoh and his attorney that the deal is off. Sir, I warned the attorney that if I did not receive the scanned booking confirmation and receipt for the Sofitel hotel WITHIN 24 HOURS that I would not continue with this deal. WHERE is the hotel booking I was PROMISED that was made? It is PLAINLY OBVIOUS to me that the attorney NEVER had any intention to book the hotel I required. Simply, the attorney has LIED to me. I do not appreciate this. To you sir, thank you for your offer but there is no way that a man of my stature is going to stay in a poxy flea-ridden guest house. I it seems I am not going to be supplied with the hotel room of my choice, so now I will take my business elsewhere. Please pass on this email to both parties. I am sick & tired of their lack of professionalism. Time to finish the deal here and now. Subject: LATEST DEVELOPMENT,FROM FREDRICK MOMOH !!! 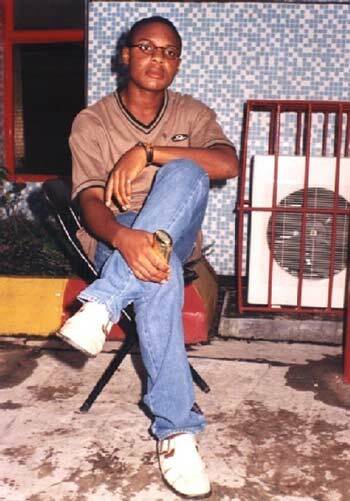 How are you dear? I hope very fine.I am very sorry that I could not be able to write you yesterday due to the time that I came back from the bank. I and my attorney informed the bank manager which he told us that their guest house is very available which is also very close to the bank.So,I think that the idea is very ok. The bank manager also made us to know that we are not going to pay any money since it is theirs. PLEASE stop calling me 'my dear'. I am not you bloody wife sir. Why are you telling me such LIES? You told me yesterday that the Sofitel Hotel had been booked for me, and then today you talk nonsense about a guest house! Here is part of your email that you sent to me: "How are you over there?I hope that you are alright.Yes I and my attorney have succeeded in booking a room in hotel sofitel as you requested." WHERE is the Sofitel BOOKING RECEIPT? If you have booked the Sofitel as you say, WHERE IS THE RECEIPT? It seems obvious to me that all your emails, and all the emails from your attorney's are just LIES to make me look a fool. You have until 8pm TODAY (25/09/03) to send me the BOOKING RECEIPT for the SOFITEL. If you do not send me this BOOKING RECEIPT which has the CONFIRMATION NUMBER I will end the deal immediately. Once I have the receipt I will then contact the Sofitel directly on the REAL telephone number of (+225)20318000 to confirm the booking. Sir, I do not expect any more feeble excuses. Subject: VERY URGENT PLEASE !!! After all this money belongs to me and not yours,so you can tell me what to do either.Just send me a "POWER OF ATTORNEY" so that I will start looking for another person that will help me transfer my inheritance out of the country for it's safety and also for the proper investment. I do await to receive the power of attorney from you so that I will start immediately because there is no any time to waste. Is indeed a THIEF, a SCAMMER, a LIAR and a 4-1-9 ADVANCE FEE FRAUD mugu. I guess our emails are now coming to an end, so I have better put you and your THIEVING friends out of their misery. Of course, from your VERY first email I was fully aware that you were a THIEF, and all you were wanting to do was STEAL my money. I know very well about all the 419 activities going on in your part of the world. I am not of course Bjorn Ulvaeus. In fact the real Bjorn Ulvaeus is in a real band, but sadly it is not me. 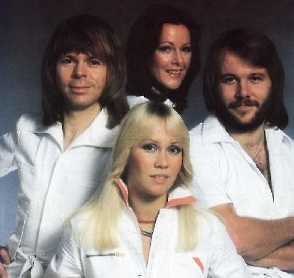 The band that the real Bjorn is in is called ABBA. Do a search on the Internet and you will find a lot of information about them (and Bjorn!). I am very surprised that you were fooled by me using such a famous name, but perhaps in your country you have never heard of ABBA, so maybe I can forgive you for being so EASILY tricked. There is NO SIXTEEN MILLION FIVE HUNDRED THOUSAND DOLLARS. You know it, I know it, and any sensible person would know it. Your name is probably not Fredrick Momoh. You have probably been using a false name as I have. The photograph you sent to me is probably not you. This does not matter. The fact is I wasted your time sending it to me. 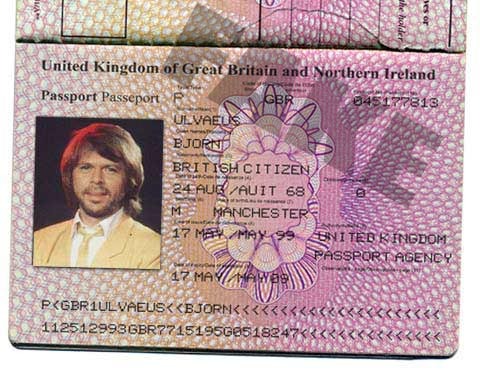 The passport I sent you is of course a forgery, The real Bjorn Ulvaeus is in fact Swedish, not British. Did you not inspect the passport carefully Frederick? Surely you know that the pose on the picture would not be allowed on a British passport. 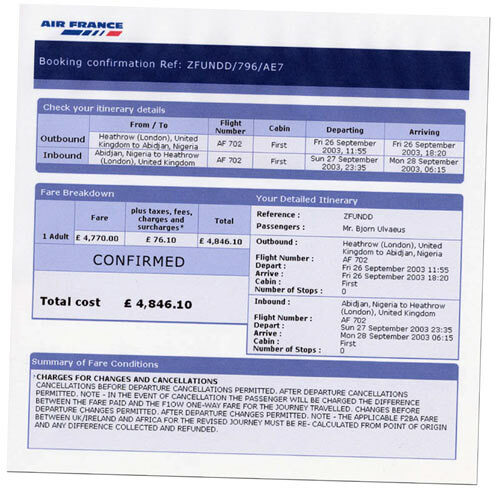 Yes, you guessed it, the flight booking receipt I sent you is also false! Of course, if you did some checking you would realise that the receipt I sent you was false. Some words of advice: Please try to make your stupid storied more believable. Also, try to use different types of stories. This year alone I have received hundreds SCAM letters, and nearly all of then use the same basic story line Do you guys make any money out of this? If you do, then I urge you to spend some of your stolen money and find someone who can write more convincing stories. Also, WHY DO YOU PEOPLE ALWAYS WRITE IN UPPERCASE LIKE THIS? Only junior boys write like that. As soon as I see people writing all their letters IN UPPERCASE LIKE THIS I know immediately that they are scammers. Please do not write back to me with your pitiful excuses. I have heard all the excuses and stories. Of course, you will probably write back to me to tell me your 'deal' is true, like so many many others of your type of people have done with me in the past. My advice: DON'T EVEN BOTHER. I will simply not believe a single word you say. Also, a good trick that mugu's like you like to use is the story that "I knew you were false all the time". Of course this is COMPLETE RUBBISH!